Accomplish Press in conjunction with BlackandOutspoken, presents an evening of reading, conversation and inspiration with the best of new generation African Writers. The event will be a mixture of literature, poetry and spoken word performances, as well as a panel to discuss issues relevant to writers in the UK. Making Money from Writing: Is it possible to make a living as a writer? The future of publishing in the UK: is it traditional publishing, self-publishing and collaborative publishing or hybrid publishing? Who is our audience? Our community or beyond? Abidemi is an author of several books (including Kemi’s Journal, God Has Daughters Too and Zack’s Story), the founder of Ready Writer, a content creation and training agency, and the editor of Ready Writer Mag. Her critically acclaimed book Eyo was shortlisted for the Commonwealth Writers’ Prize. She has written extensively for Christian magazines, The Guardian, The Cabinet Office/No 10, Unilever, Methodist Church, UN, Directgov and others too traumatic to remember. In her spare time, she loves cooking, running and photography. Born in Nigeria, now living in the UK, with dreams of emigrating to Zanzibar and never experiencing rainy weather ever again. She is represented by the fabulous Elise Dillsworth Agency. Abimbola Dare commenced her writing career as a blogger in 2006. Her hilarious blog which documented the life of an immigrant learning to adjust to life in the UK soon became one of the most visited blogs in Nigeria at the time. In 2008, she took a maternity break-which essentially became an opportunity for her to write her first Inspirational (christian) novel, ‘The Small Print’. Having sought for, and finding no Christian fiction publisher in the UK, she decided to establish her own company. ‘The Small Print’ was released in 2011 and became one of the best selling e-books in Religious romance genre on Amazon UK-for more than six months. For a self published author in a relatively unknown genre within the UK, the success of ‘The Small Print’ was a welcomed surprise and driver for exploring a niche with potential for massive growth. She has written a number of short stories, including the hugely popular, ‘The No-nonsense wife’ which instantly became an internet sensation. In January 2013, she was nominated as author of the year by the Women4Africa panel. Her second novel, ‘When Broken Chords Sing’, peaked at number 2 spot on the kindle bestseller list for Christian Fiction in the UK. She has been featured in major newspapers and magazines across Nigeria, and juggles novel writing with working full time for one of the largest publishing firms in the world. 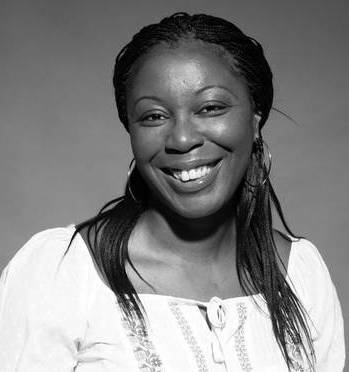 Irenosen Okojie is a writer and Arts Project Manager. She has worked with the RSC, Apples & Snakes, The Southbank Centre, The Caine Prize and programmed for Duckie for their series of interactive nights. She was a selected writer for the Flight mentorship scheme for young writers run by Spread the Word and for the 30 Nigeria House Project by Theatre Royal Stratford East. Her work has been featured in The Observer and The Guardian amongst other publications. Her short stories have been published internationally and her debut novel will be published in 2015 by Jacaranda Books. She is the 2014 Prize Advocate for the SI Leeds Literary Prize. Ola Nubi attended intermediate and advanced writing courses at the Centerprise Literature Development project in Hackney, London before studying for an MA in Creative writing and Imaginative Practice at the University of East London. In 2008 her short story The Pink House, won first prize in the National words of colour competition and another short story of hers The Go- slow Journey, won the first prize in the fiction category for Wasafiri’s New writing prize 2009. Some of her short stories feature on African writing.com, StoryTime, This Reading Life, TheSiren.co.uk and naijastories.com . She had another short story – Green Eyes and an Old photo published in the 2013 African Roar Anthology and her short story – Illusion of Hope was published in the NS Publishing short reads series – Wiping Halima’s Tears. She is currently working on a collection of short stories based on the African experience in the Diaspora, and a novel – a cross cultural romance that explores the social, political, cultural and historical ties that bind and divide the cultures. She has a romance novel due for publication by Ankara press – the Romance imprint of Cassava Press, Abuja. Nigeria. This amalgamation of quotes more or less sums up my philosophy in life, a belief that good things can come my way if I believe, work hard to make that belief reality and pray with everything I’ve got for a success. I wake up daily in Coventry where I reside, grateful to God for my 52 years on earth, my two wonderful daughters and good health. I’ve been given the amazing opportunity to live my dream as a writer and publisher after obtaining my Masters degree in Writing from Warwick University in 2012, where I’d also obtained my Law degree over 27 years ago!! I presently run my own self-publishing company, Canaan-Star Publishing, with writers from around the world. Best of all, I’ve finally discovered that Holy Grail of every writer…Voice! With my last book, The Reluctant Dead (28th June, 2014), I finally found a voice and a genre that flows naturally and effortlessly, feels right and sits well with me – African/Igbo horror! As a working lone-parent, I continue to hope for literary success, inner contentment and a life finally free of stress! I believe and it shall be! Tundun Adeyemo was born in Lagos, Nigeria. She studied Law at the University of Ibadan. She proceeded to England for a Masters in International law. She is currently pursuing a Doctorate in Human Rights Law at the University of Bedfordshire. She has written poems and short stories since she was eight years old. An avid reader, she loves reading, travelling and meeting people. She writes a column for Nigeria’s TELL magazine and ‘The Immigrant’ is her first ebook, with a collection of non-fiction articles soon to be published. Kemi Ogunniyi is an author, editor and communications consultant. Her most recent project is ‘Tales of Mr Tortoise’, a not-for-profit children’s book she has published in partnership with 1Child1Book.org to improve UNESCO literary figures for Africa, starting with Nigerian children who cannot afford books. She has also written four full-length adult novels awaiting publishing and popular weekly blog fiction series. Sade recently completed a postgraduate degree in film at Staffordshire University run by Raindance. She’s a self-published author and her debut novel Imagine This, won the 2008 Commonwealth Writer’s Prize. A book she has adapted into a script and she is currently looking for finance to fund her feature film. Sade made her first short film last year – More Cake – also an adaptation from one of her short stories. More Cake was shown at the Molodist & Raindance film festivals in 2013. Sade has also written pieces for Radio 4, BBC World Service the Lyric and Bush theatres. In her spare time she also produces short story podcasts promoting African literature and writers (SWoSSP). The first series along with her own short story podcasts can be found on iTunes, SoundCloud, Mixcloud or her website www.sades-world.com/podcasts. 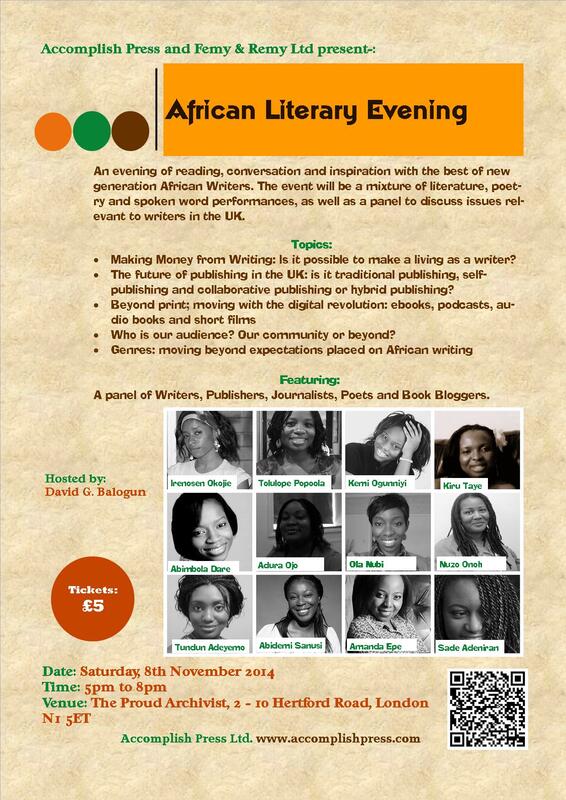 Tolulope Popoola – she will be reading from her book, “Nothing Comes Close” as well as a couple of flash fiction stories. 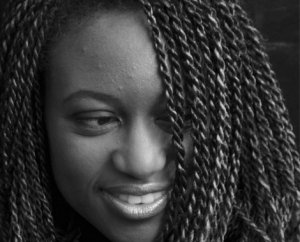 Tundun Adeyemo – she will be reading from her debut collection of poems, “The Immigrant”.